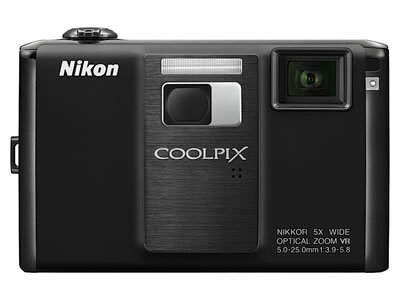 The Nikon Coolpix S1000pj camera is more than a point-and-shoot; it's a point-and-shoot-and-project camera. The camera includes an LED-powered projector that puts up 40-inch slideshow images of the pictures you just took. Apparently it also offers special transition effects as well. Fans of Jack Vance have been waiting about forty years for this. In his 1971 novel The Anome, Vance describes a pocket-sized device that takes pictures and then projects them for viewing. Ifness drew from his pocket a tube of dull black metal an inch in diameter, four inches long. Along the flattened top a number of knobs caught the light and glittered in Ifness' hand. He made an adjustment, pointed the tube at the wall beside Etzwane, and projected a cone of light. Etzwane had never seen a photograph so detailed. He glimpsed several views of the Corporation Plaza, then Ifness made new adjustments, sending a thousand images flickering against the wall. The picture became still, to depict Pandemon Park and the people who had come to hear the 'anonymous adventurer'. See also a short presentation video of the Coolpix S1000pj. Via Engadget; thanks to writer and cognitive designer Dominic Brown for passing this one along.